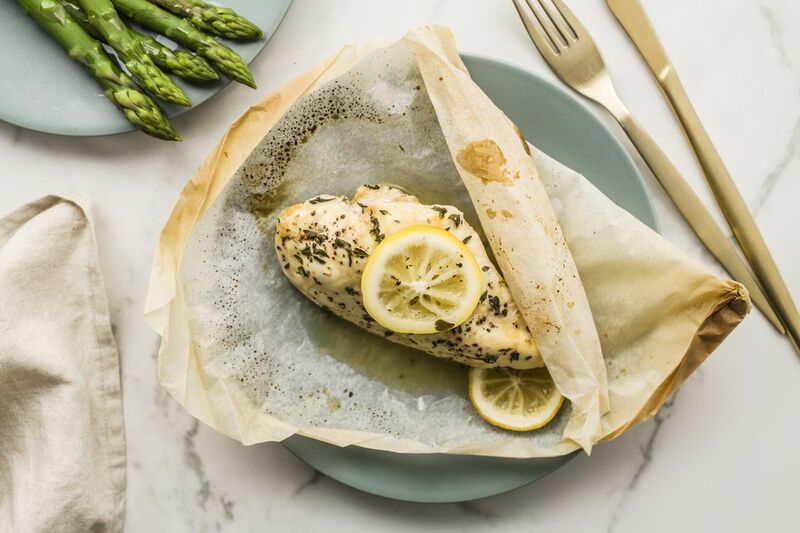 Cook boneless, skinless chicken breasts in parchment paper and you'll always have moist, tender, juicy, wonderfully flavored chicken to use in sandwiches, salads, casseroles, and soups. This is a simple and foolproof way to cook a lot of chicken at one time. The parchment paper seals in the moisture, so the chicken steams in its own juices and retains a lot of flavor. Add a citrus slice, some dried spices, and salt and pepper to flavor the chicken and you've got a meal in a packet. Place a 12- x 12-inch sheet of parchment paper on a large cookie sheet. Fold it in half and cut it into a heart shape. Unfold the paper and place one chicken breast in the center of the heart shape. You can make as many bundles as you like and bake them at the same time as long as they are in a single layer and there is 1-inch of space surrounding each bundle. Sprinkle the chicken with salt, pepper, herbs, and spices, and top with lemon, orange, or lime slices, if desired. Bring the edges of the paper together and fold together to crimp closed. Be sure to leave some room inside the bundle for heat expansion which will happen as the chicken bakes. Bake for 15 to 20 minutes or until the chicken registers 160 F on an instant-read meat thermometer. Remove chicken from oven and slit open the parchment paper being careful that the steam doesn't burn you. Peel the parchment paper back a bit and serve each packet on individual plates. Pair with your favorite sides and enjoy! All ovens are different, and all chicken breasts are various sizes, so the baking time might be different for you. Make a note of the correct time for your oven so the chicken will be cooked perfectly every time. You also can bake the bundles at 350 F for 30 to 40 minutes. If using frozen chicken breasts, bake at 400 F for 55 to 65 minutes, or bake at 425 F for 45 to 55 minutes until the meat is done as directed above. Cooking chicken this way is much cheaper than buying pre-cooked chicken (especially a rotisserie chicken). Prepare 10 or more chicken breasts in parchment using the directions above. Let the chicken cool for about 20 minutes and then chop it into pieces or shred it. Pack in freezer containers or zip-top bags in 1-cup portions. Label and date and use within 3 months. To use the frozen cooked chicken, let it stand overnight in the fridge until it's thawed.